Ladies, if you have seen the "yard long" paintings on canvases that are a yard long, by 19th century painter Paul De Longpre, a French man who lived in California (whose son also became a painter) you know how beautiful they are. 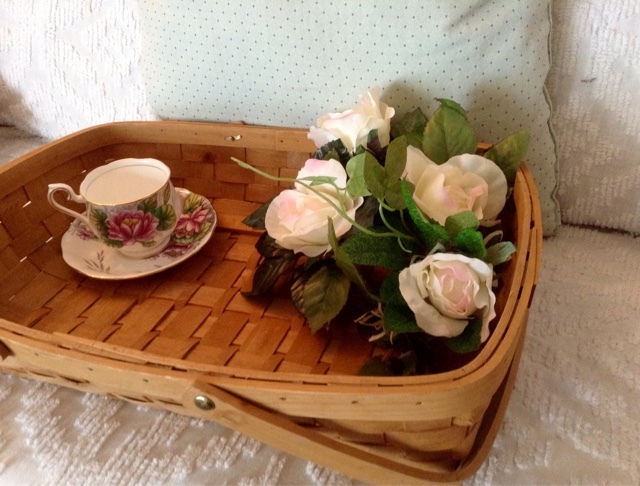 There is a small town near here whose shops do not yield much, but I found a lovely wood basket in Goodwill and a really classic looking sprig of silk flowers, and have begun a bit of a vignette to lighten a dark corner in our home. 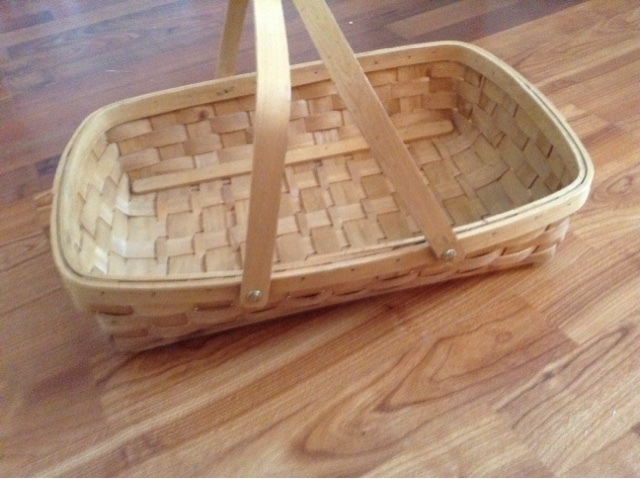 In 18th and 19th century paintings I have seen, basket styles are often, if not always, identical to baskets we see today. Sometimes it is a comfort to see objects have remained the same in style, connecting us to our great grandmothers and thinking how they used the same common things. It needs to be dusted off, and freshened up. Also I found this classic looking silk floral. I know stores are changing their style of home goods, but it brings a smile when I find classics like this. 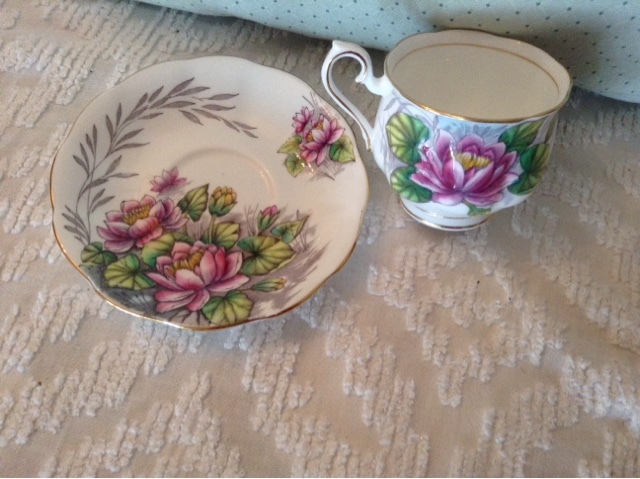 As I have learned more about the quality of tea cups, only the new or barely used ones come home with me. I explained that some time ago. If you are looking at a cup at a thrift store, look at the rim, where you'll be drinking, and see if it is worn out. Run your hand around the top of the cup and the edges if the saucer to detect any roughness. Since I began doing that, I have only brought home what appears to be brand new teacups. Never put them in the dishwasher and they will keep that nice smooth and shiny finish. I do use soda bicarbonate to clean the stains but I am not sure if that is abrasive enough to wear off the nice finish. Because an older cup sprung a leak, it was a delight to find this to replace it. So here is it is, partially filled. I may end up using it for a gift, since there are several people I know who need one. I will include some other homey things. Sometimes I practice "shop your house" when I need a gift in a hurry. 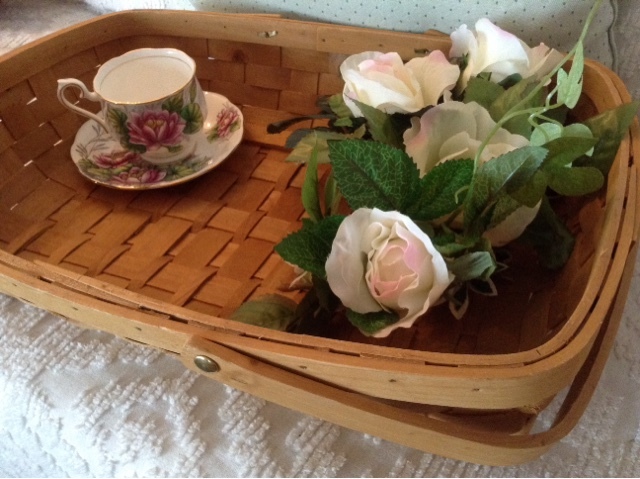 I find a basket, a pretty magazine, tea cup, quickly sew up a table runner or cloth, and make a card. I realize some ladies would find no use for this kind of gift, but I do try to custom make it for the receiver. Books and writing materials, plants, sewing supplies, candles, special herbal things, etc. are sometimes included, depending on the interest of the person. This teacup looked never-used, I guarantee. 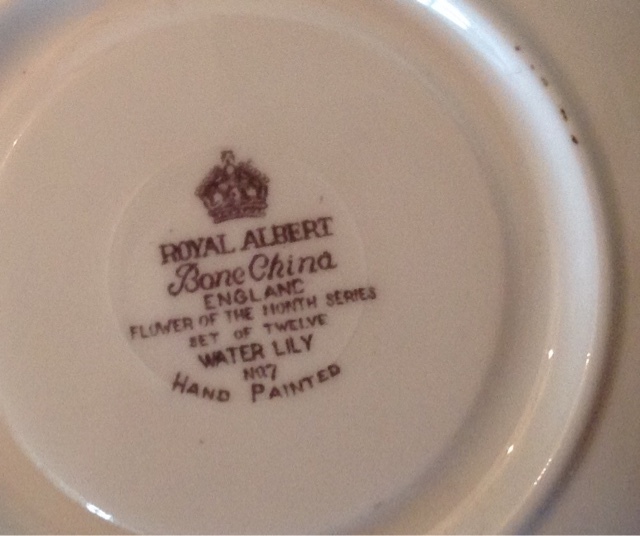 The printing on the back says it's a part of a Royal Albert flower of the month collection, number 7. Now if you are new here, you may wonder what in the world anything like this, or home decor or crafts, etc, have to do with the overall Titus 2 message of the home. While I cannot prove with scripture that making the dwelling place lovely is essential, I do know it is scriptural to bring glory to God in all you do, in work, play, rest, creativity, vacation, hospitality and more. It is also one of those ideas which I, and many other homemakers came across when attempting to create a sense of well being in the home. While loveliness in the home is not any specific command, it is a natural result of keeping house, which is part of the Christian woman's life. 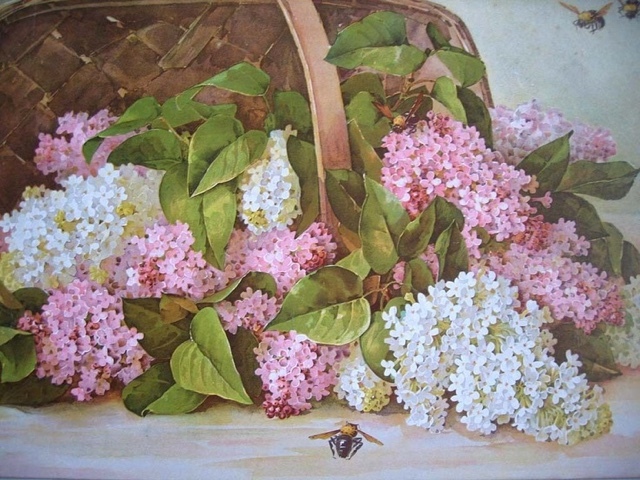 Even in the rough-hewn log houses some of us lived in, we as children brought bouquets of wild flowers in in tin cans and jars for our dining tables, and gave our parents our own drawings and paintings to hang on the walls. Mr. S. enjoys gifting the home with a needed new clock or a lamp, a new blanket or rug or such. He likes new office supplies and yard tools. When difficult times come along, cheering up the house can alleviate some of the uncertainty. In happy times, home decor can punctuate the atmosphere like a thank-you. An accent of beauty somewhere, shows your loved ones you care about where they live and what they have to see. The same applies to the homemaker's appearance in dress and grooming, but that is another subject. Adding something beautiful is a reflection of our great God and Saviour, Jesus Christ, who created a home on earth for us while we live, and gave us so much more, spiritually. I don't think we should merely "exist" at home. I think adding beauty to the home is a way of guiding and guarding the home, and glorifies God when the furnishings and decor are lovely. When I am in someone else's home I feel the refinement and the gentleness they put into it, and detect it as an expression of how they feel about life, love, and Christ. Ecclesiastes 3:11 - "He hath made everything beautiful in its season." I totally agree Lydia, that it is so important for us to find ways to bring beauty into the home. I haven't always been good at this but I am getting better. I'd like to share a tip I have discovered only recently - that if you search the bedding section of the thrift store, you can find some wonderful table cloths. I used to search for vintage table cloths (I love floral ones, or the kind with pictures of tea pots and things like that), but I have found that they are almost always too small for our kitchen table. But I realized that you can buy a twin sheet for half the price of the table cloth and it will be nice and big. I recently bought on a 50% off day a beautiful vintage twin size sheet for $1.25. 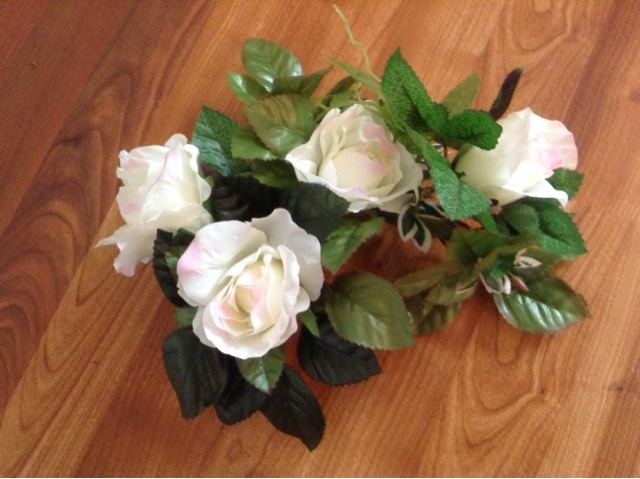 It is covered in bright yellow roses and looks to be from the 1960s. It really brightened up our kitchen and no one would ever know it is actually a sheet. I have also bought plaid sheets that make very nice table cloths. Just thought I'd share that little tip! This was so encouraging. I have a dear friend with whom I exchange birthday and Christmas gifts each year. We often give each other a homemade gift or even a nice vintage or "thrifted" gift that we know the other would enjoy. 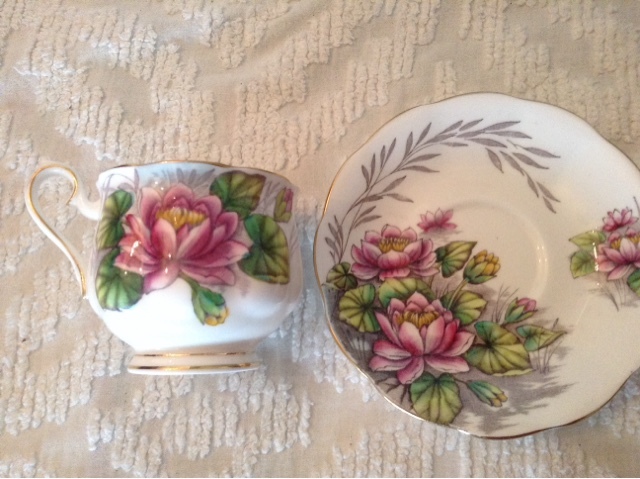 I recently found 2 nice teacups with Audubon images of two birds, one of which was one of her favorites! So fun, and less expensive, but more meaningful many times. Thanks for your post! Thank you Lady Lydia for this lovely idea and words about how we reflect the Lord in our homes when we furnish and decorate it with thought and care. I am one of those people who likes and enjoys taking the to time to make my home a comfortable and inviting place for family members and for visitors. So many people who come to my home comment on how cozy it is and how much they love being here. Sometimes I think it is too prideful of me to enjoy those compliments, but I also realize that my guests feel so thankful and special because they know I have done it for them as well as myself. They feel like they want to visit longer and that things were done specially for them. For a long time I felt that decorating my home was just a secular hobby, but in reading your writings I have realized that is instead part of my biblical womanhood. Thank you for that inspiration as well! Most tea cups ypu see with gold on them were made in the 1960's and the ones that seem to be new are that way because so many people collected them for their beauty, but didn't use them. This recent find looked like it had been kept in a china cabinet for display. Ypu also have to investigate for cracks. And when there is a dab of gold paint or a flaw that looks like a speck, it is okay to buy. A speck sometimes is just a bit of the color. You can use tea cups for any kind of denm, even lemonade. The plaid sheets sounds like something I would like to find. I especially like all cotton or all linen, without polyester. It looks fresher and crisper even if it is old. A lady of my acquaintance told me that she didn't feel the least apprehensive about home decor, because each piece represented something given to her by family members , friends, or inherited. She rightly expects that as we get older we will accumulate more and our houses will not be as bare as when first setting up housekeeping, and so she views all her pretty pillows, quilts and furnishings as God's blessings. Now and then someone will say it's too materialistic to have things, and it worries some women, who sometimes, in an effort to look less materialistic, will purge unnecessarily some things they later need. This is one reason it was always necessary to have an attic or a little shed near the house, to store things you were not using, and then, if you didn't miss them or need them, you could get rid of them. Just another thought on cleaning away tea and coffee stains, Lady Lydia. I visited my mother-in-law once and watched her break a denture cleaning tablet in half or quarters and drop a piece in her coffee cup with water and let soak. I thought it so smart, because if it's safe enough for dentures and their finishes, it should be safe enough for a tea cup. I asked her about it and she said she only does it when the stains build up, so not frequently. Have a lovely week's end!